The first model in the new Genie Xtra Capacity (XC) family, the Genie SX-135XC boom lift is packed with industry-leading features, including 90-ft. (27.43 m) of outreach, 660-lb. (300 kg) unrestricted lift capacity, the ability to work 19 ft. 8 in. (6 m) below grade and a 12 ft. 11 in. (3.94 m) x 13 ft. 6 in. (4.11 m) compact footprint. The Genie SX-135XC self-propelled telescopic boom lift delivers industry-leading outreach and capacity throughout the full working envelope for incredible operational accessibility. The first model in the new Genie Xtra Capacity (XC) family, the Genie SX-135XC boom lift is packed with industry-leading features, including 90-ft. (27.43 m) of outreach, 660-lb. (300 kg) unrestricted lift capacity, the ability to work 19 ft. 8 in. (6 m) below grade and a 12 ft. 11 in. (3.94 m) x 13 ft. 6 in. (4.11 m) compact footprint. “With 10 feet more outreach and 32 percent more capacity than typical self-propelled boom of this size, the Genie SX-135XC boom lift is ideal for rental customers working on challenging jobsite applications with its unique up-and-over style capability to navigate obstacles at height,” said Adam Hailey, Genie director of product management, Terex AWP. Built to safely and quickly lift operators to full platform height — 135 ft. (41.15 m) — in 2-1/2 minutes and drive enabled at full height, the Genie SX-135XC boom lift will position workers and gear exactly where they are needed. And, it's powerful enough to work on most job sites with a Deutz TD2.9 L4 74-hp (55 kW) Tier IV/Stage 3B emissions-compliant diesel engine with four-wheel drive and four-wheel steer capabilities. The Genie SX-135XC boom's innovative design includes a working envelope ideal for the most extreme access jobs with a working height of 141 ft. (43.15 m) and a horizontal reach of 90 ft. (27.43 m). That's 10 ft. (3 m) more of outreach than any other self-propelled boom the market offers, according to the manufacturer. The new Genie SX-135XC boom also boasts exceptional range of motion with an 18 ft. (5.48 m) to 30 ft. (9.14 m) telescoping Jib-Extend jib, which offers operators up and over capabilities, as well as 125 degrees of jib articulation, boasting 55 degrees down to 70 degrees up of vertical articulation. The working envelope also is increased with this boom's extended reach out and down capability — 19 ft. 8 in. (6 m) of reach below grade. 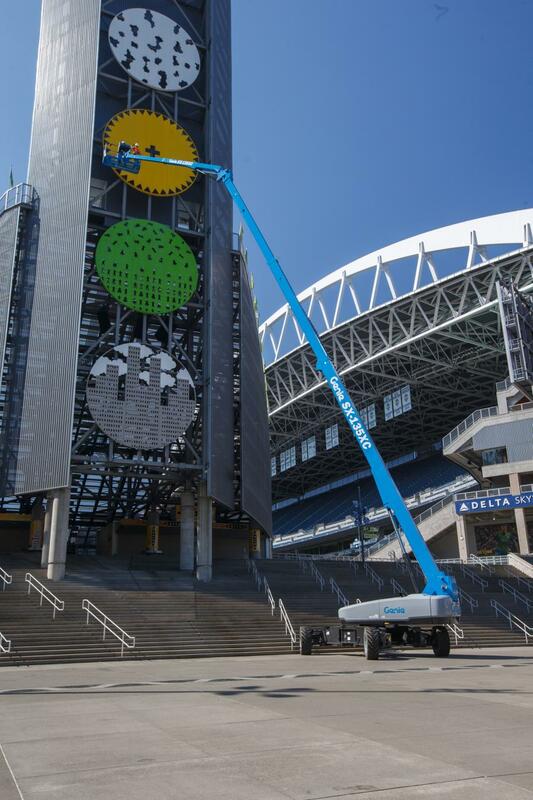 “To accommodate the Genie SX-135XC boom lift's increased capacity and range of motion, Genie engineers developed a new hydraulically telescoping Jib-Extend design that is robust enough to handle all of the up, over, out and below tasks rental customers need to do. And when the job is done, the jib is designed to be stowed under the primary boom for ease of transport,” Hailey said. Designed with transportability in mind, the Genie SX-135XC boom features the new Genie mini XChassis axle design, which extends and retracts the axles to and from the stowed position with a more compact footprint — 8 ft. 2 in. (2.49 m) by 13 ft. 6 in. (4.11 m) retracted or 12 ft. 11 in. (3.94 m) by 13 ft. 6 in. (4.11 m) extended — to provide both stability on the job and a narrow profile for transport. “Similar in design to the full-size XChassis expanding axle on the Genie SX-150, SX-180 and ZX-135 booms, the mini XChassis system boasts two-thirds the footprint of the full-size version for excellent maneuverability on and around confined job sites without disrupting people or traffic,” Hailey said. Weighing 47,900 lb. (21,727 kg), with an overall transport length of 43 ft. 7 in. (13.3 m), a tail swing of 3 ft. 9 in. (1.14 m) and ground clearance of 15 in. (0.38 m), the Genie SX-135XC boom lift is transportable on a standard trailer; no over width or over height permits are required. With the ability to perform a wider range of heavier lift and access tasks on rough terrain using a single machine, the new Genie family of XC boom lifts, including this Genie SX-135XC model, offer a dual lift capacity with an unrestricted 660 lb. (300 kg) and a restricted 1,000 lb. (454 kg), giving customers the ability to work with up to three people onboard while still leaving room for tools and jobsite materials. The new XC design includes a standard 8-ft. (2.44 m) tri-entry platform with side-swing gate. The Xtra Capacity, or XC, nomenclature also lets rental customers know that this new boom complies with the overload restriction guidelines in the proposed ANSI A92 and CSA B354 industry standards in North America, as well as the current European EN280 and Australian AS 1418.10 standards. Hailey noted that all Genie XC models include a new low-maintenance load sense cell technology that monitors the weight on the platform and disables function if the load exceeds the platform load limit. “The overload sense functionalities are compensated for on all Genie XC boom models by increased platform load capacity, increasing these booms' utilization in heavy-load applications compared to units with more restrictive platform load limits,” he said.